With over 13,000 members' spread across 83 countries, The Royal Academy of Dance (RAD) is one of the largest and most influential dance education and training organisations in the world. Established in 1920, to improve standards and re-invigorate dance training initially within the UK, the Academy helps and encourages its teachers to perfect their teaching skills and pass on this knowledge to their students. There are currently over 1,000 students in full-time or part-time teacher training programmes with the Academy and each year, the examination syllabus is taught to more than a quarter of a million students worldwide. The Imperial Society of Teachers of Dancing (ISTD) is the world's leading dance examinations board. Formed in 1904 it is today a registered educational charity and is the only organisation that covers the full spectrum of dance examinations on a truly global scale. 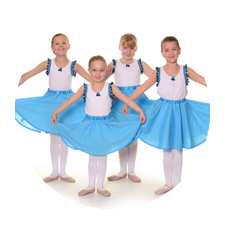 The Dancing Boutique Tunbridge Wells supplies the Weald School of Dance with all their dance wear, shoes and accessories. The shop visits several times a year to ensure the correct fitting of uniform and shoes. Langley Parish Council and the Langley Village Hall Committee continue to support our dance school. Lance French offers a complete service to deliver good looking, functional websites for organisations of all sizes. Based in Langley, Sutton Valence, the Weald School of Dance offers quality dance training for children from three years, up to adult. Whether you have a dream of joining the profession or a desire to find freedom and enjoyment through movement, the Weald School of Dance has something for you.